One of the Florentine artists featured in Giorgio Vasari’s tome of Italian art, The Lives of Artists, Puligo painted in a style amongst contemporaries like Ghirlandaio (1483 – 1561), and Andrea del Sarto (1486 – 1531). This influence was of course due largely to his training under Ghirlandaio and workings as an assistant for Sarto. There is also an influence in his work from Jacopo Pontormo (1494 – 1557) and Il Rosso (1494 – 1540), both of whom some of Puligo’s work was misattributed for. His best known work is a piece titled, Vision of Saint Bernard, now in the Walter’s Gallery in Baltimore, U.S. 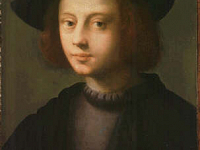 He had much success in portrait work and became an in demand artist in Florence. His piece, Portrait of Piero Carnesecchi, from 1527 is now in the Uffizi Gallery. Carnesecchi (1508 – 1567) was s philosopher of humanism at the time, who gained much favor under the Medici court, but in his reformist activities was later betrayed and executed by Cosimo I de’ Medici. Puligo’s earliest known work is the Virgin and Child with Saint John, done in the style of Ghirlandaio, who was the son of the renowned Domenico Ghirlandaio (1449 – 1494). The greater influence of Sarto comes in his later pieces, such as Holy Family, Virgin and Child with the Infant Saint John and Mary Magdalene. In some of these later works there is also a noted influence of the artist, Fra Bartolomeo (1472 – 1517) and the far reaching influence of Raphael (1483 – 1520).